Simplify your inbound and outbound supply chain operations with a holistic ERP solution. 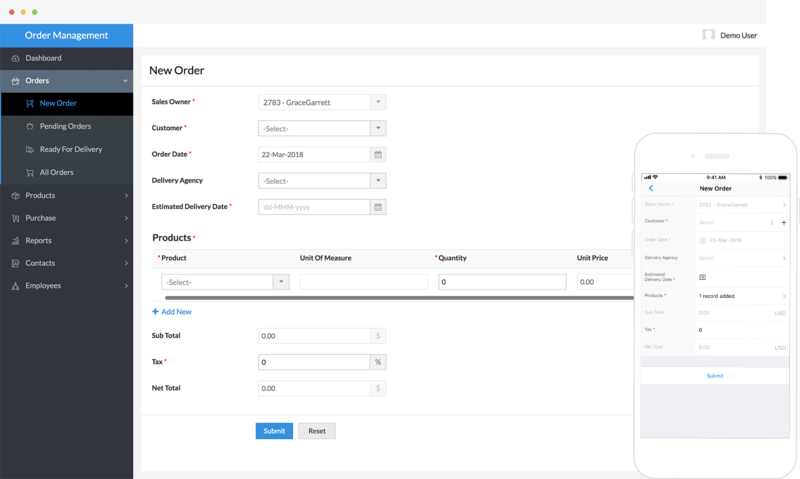 This order management suite features advanced workflow automation, cross-channel integrations, and end-to-end order fulfilment, helping you save time and boost overall productivity across your value chain. Optimized order handling and inventory control. 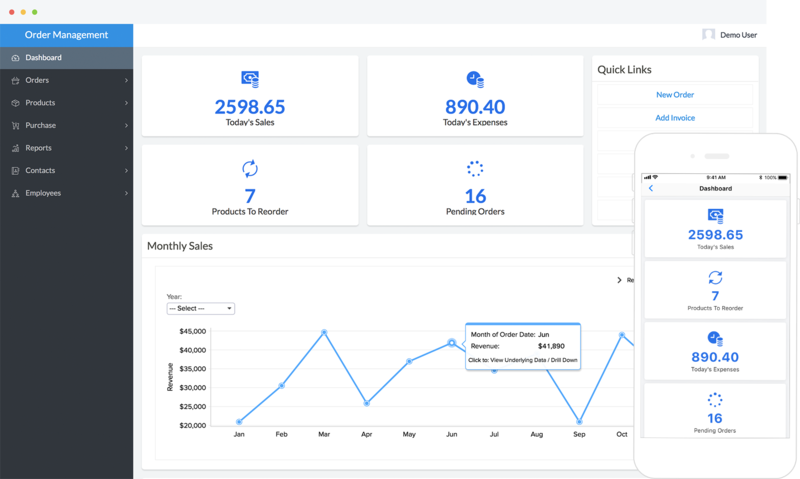 The dashboard displays mission-critical information: order statuses, expenses, inventory, and periodic sales. The data comes from comprehensive reports — you can choose from up to 20 different chart styles, and view exhaustive drill-downs with a single click. Use a centralized hub to monitor and regulate your sales channels. 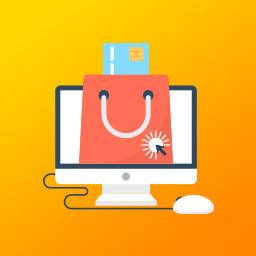 Integrate with a host of third-party e-commerce sites that synchronize with your inventory and automatically update information based on orders fulfilled. Take advantage of order consolidation features that combine multiple orders into a single receipt, minimizing clutter. Delegate inventory management to software and prevent stockouts. Set up triggers for reordering mails to send to suppliers as soon as stocks reach critical levels. Push notifications can also be configured to provide you with real-time updates about purchases, deliveries or cancellations. Generate invoices for every transaction with customers and suppliers, and send them through email with a single click. We also support integration with popular accounting applications, like Quickbooks, Zoho Books, and Xero. Use order history statements and delivery fulfillment stats to analyze customer behavior and better respond to their needs. Configure emails to automatically send to your customers after each order, delivery, receipt, or refund process. Organizing purchases has never been simpler. Configure preset orders based on consumption history and throughput reports. Add product details to order forms by simply scanning existing labels, using our mobile-only barcode- and QR-scanning features. It's not just an app. It's a platform. Our app ecosystem is fully customizable. If an app doesn't fully synergize with your business needs, you can tweak it to create a perfect fit. With guided scripting made possible by the power of low-code, you'll never be left wanting for more functionality. Any app built or customized on your computer is instantly accessible on the native mobile app for iOS and Android. Enjoy full portable functionality, as well as mobile-exclusive features like barcode scanning, camera access, and push notifications. Don't miss a beat. Built-in integrations with a range of third-party apps will keep your business seamlessly connected to your existing productivity software. Paypal, G Suite, Quickbooks, and Salesforce are just a few of the integrations we support, as well as other Zoho products, like CRM, Books, and Desk.